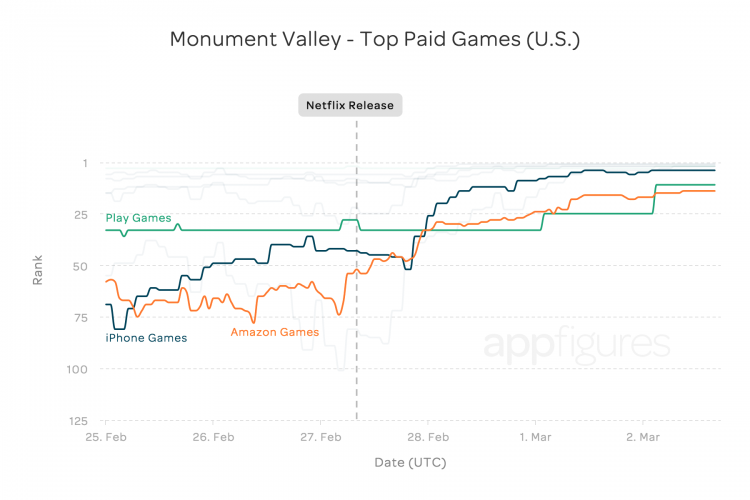 House of Cards Release Rockets 'Monument Valley' to #2 Paid App! House of Cards Release Rockets ‘Monument Valley’ to #2 Paid App! Are you a fan of the Netflix original series “House of Cards”? Kevin Spacey and Robin Wright are riveting are Frank and Claire in the popular series now in its 3rd season. In this season we see the video game-loving President play Monument Valley to decompress. And in turn, viewers turned to the app store to buy the game. The game doesn’t make its debut in the series until the fifth episode, but if anything can be inferred from the Season 2 premiere where over 670,000 people binge-watched the entire new season during the first weekend of its release on Netflix (a figure which accounted for 2% of total Netflix subscribers at the time), the show’s viewers are a devoted group. appFigures, a powerful app store intelligence platform, wondered if and how this engaged audience would affect the already popular game. The company kept a close watch on ranks data from the weekend and that the effect of the feature during Episode 5 was immediate. Almost exactly 5 hours after the third season became available to watch, the game began to ascend the ranks at lightning speed. As of this morning, the iPad version of the app was the overall #2 paid app, trailing only Minecraft – Pocket Edition; and the Google Play version was the #11 paid app. Not that the success is undeserved – Monument Valley was just awarded the Grand Prix prize for the best mobile game at the International Mobile Game Awards! Also it won the “Apple Game of the Year 2014” and “Apple Design Award 2014”. Monument Valley is also a ‘pay in full’ game where you can buy the game upfront for $3.99 and get all of the content. After release the developers released an expansion, which you can purchase in-app for $1.99 after finishing the main game.